Basil's Peak is a long rocky ridge, and we climbed it with Basil. Tom and I set aside a day to get out together. Then the hard part: What to do? It's a terrible problem. Eventually we decided on Basil's Peak, and then we found out that Big Dan had done it last weekend and written a trip report- instant beta! 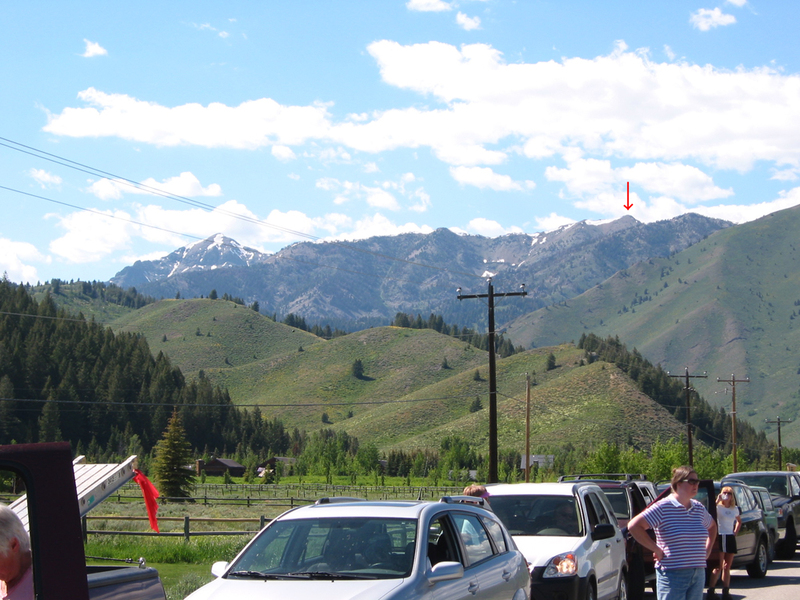 The picture shows the summit viewed from the post-climb road block that delayed our cold beers. But back to the story. Tom and Laurie picked up Julie and I at 6am and we were headed for the mountains. We picked up Basil and Sophie the wonder dog in Ketchum. After bumping up the Boulder Basin road for about two miles, we were off at the crack of 9:30. 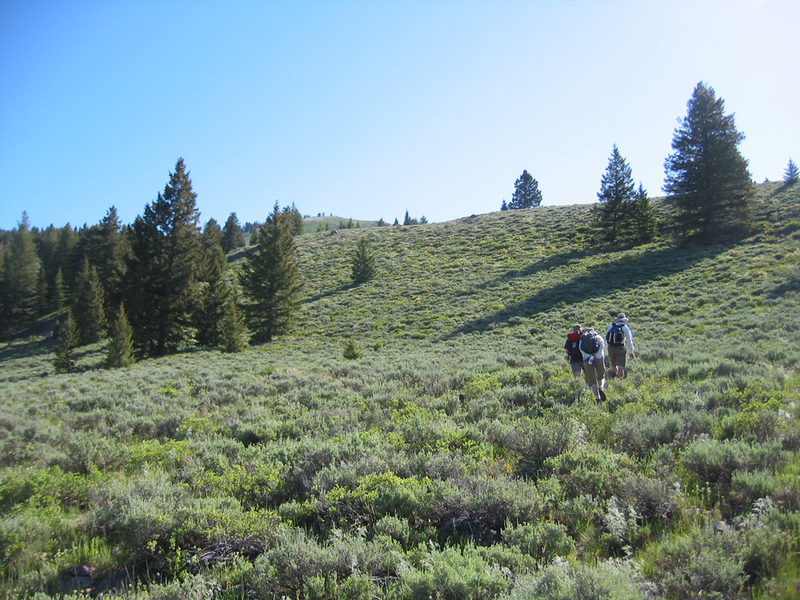 Here we are starting up the initial sagebrush ridge. It was already quite warm. It was a glorious day and we made good progress. 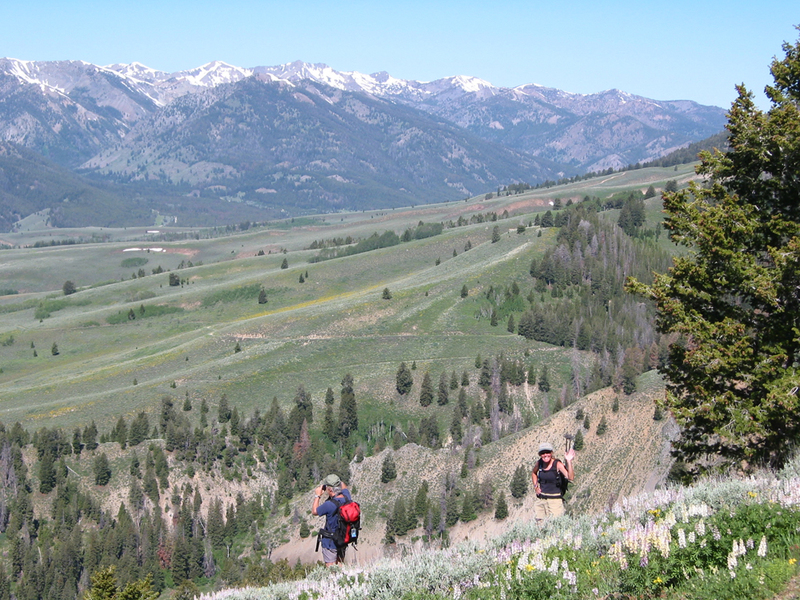 As we got high enough for a good view, we also ran into wildflowers... lots of them. The lupine in the foreground were amazing, and quite impossible to show properly in a photo. 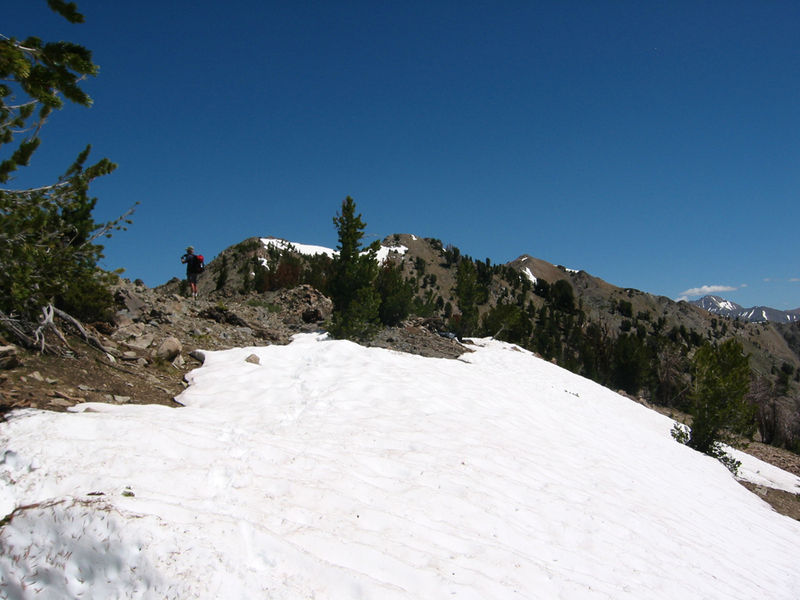 We were following a ridge, so naturally there would be lots of false summits. 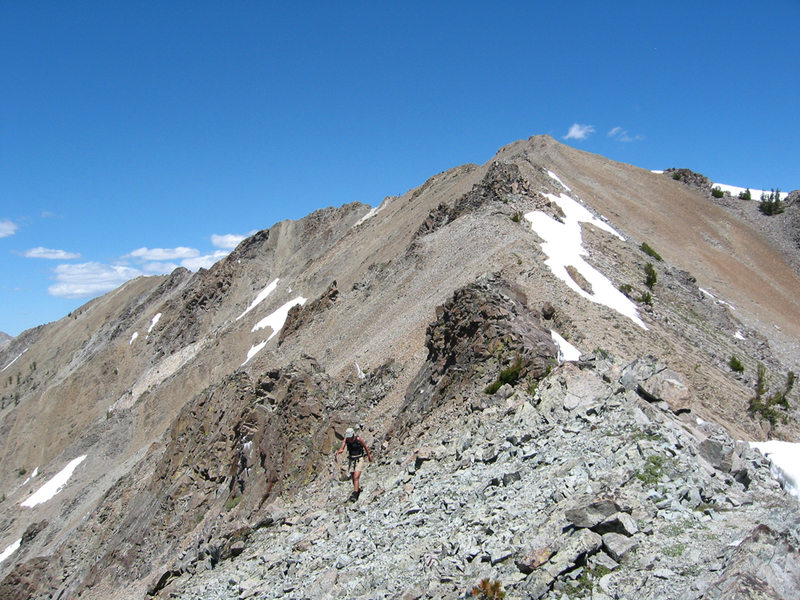 The first one, marked with a huge cairn, led us to the green saddle. 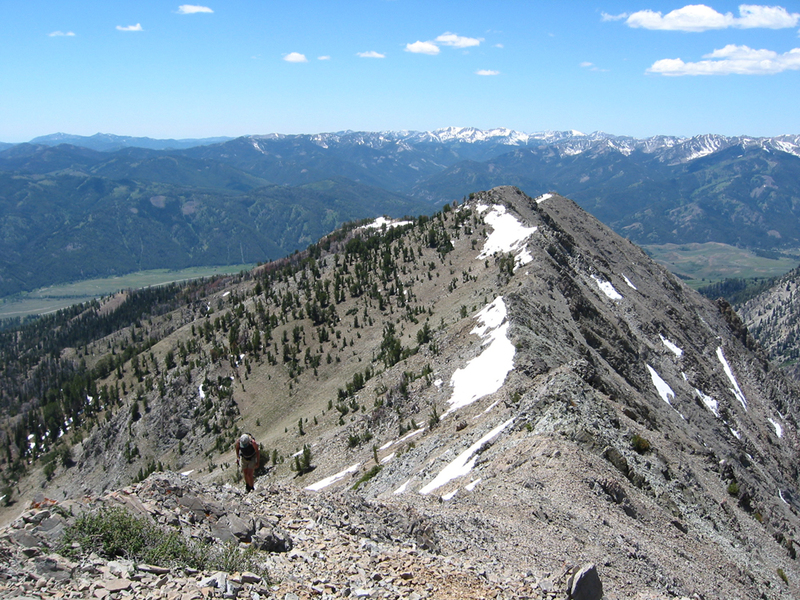 Ahead is the toe of the real ridge- a little fearsome looking, but not really bad at all. Once you get over the toe of the ridge, you can see the rest of it. The summit is on the far right. It looks a long ways off, and it is. But first we had more climbing to do to get to the false summit that is obvious on the map. 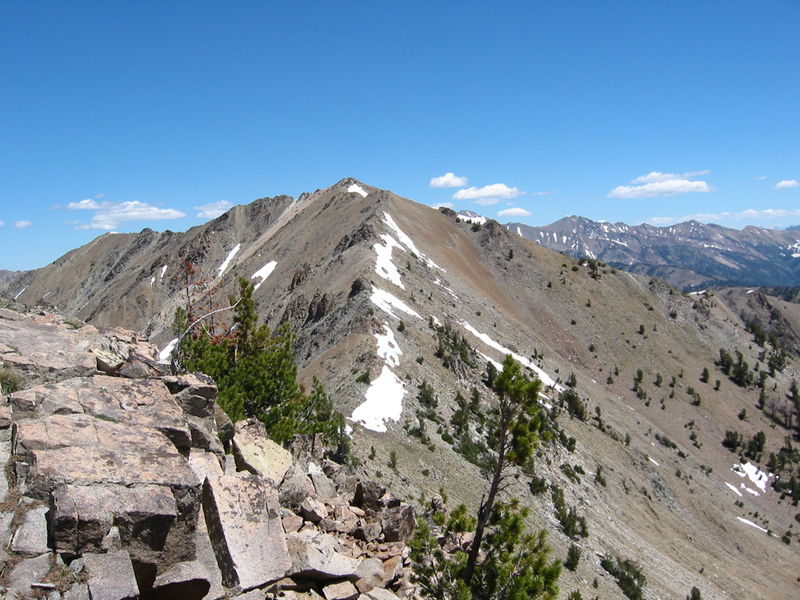 From the false summit, you can see the remainder of the ridge. 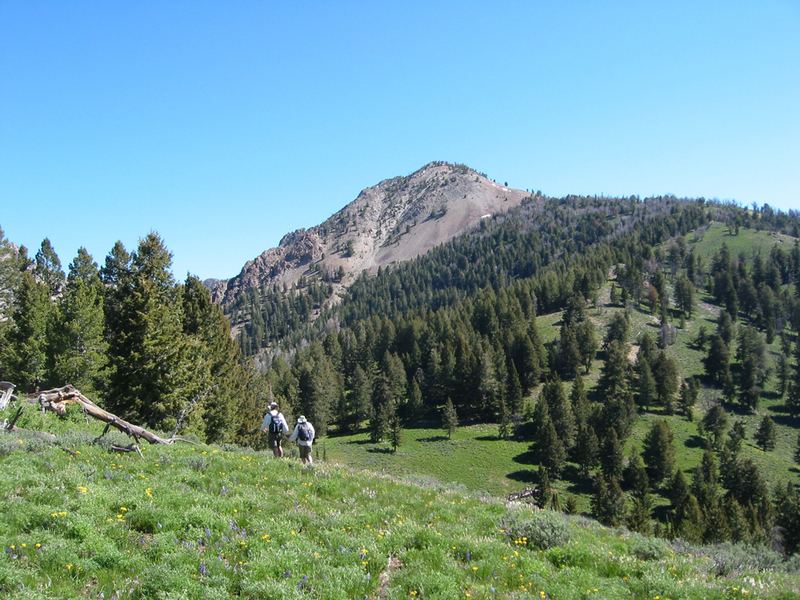 It has lots of small up and downs, and a few places that require some fun scrambling. For the most part, just stay on top and enjoy the views. Here's Julie just below the summit, with the view looking back across the ridge she had climbed. 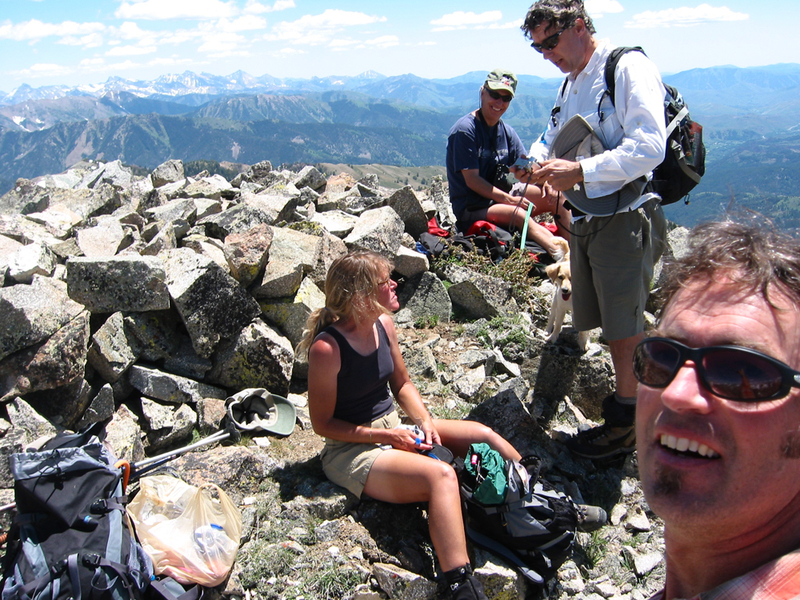 And then it was time for a rest and some lunch on the summit. It took us about four hours from the car. Basil's has great views in all directions, with the Pioneers, Smokies, and Lost Rivers in view. 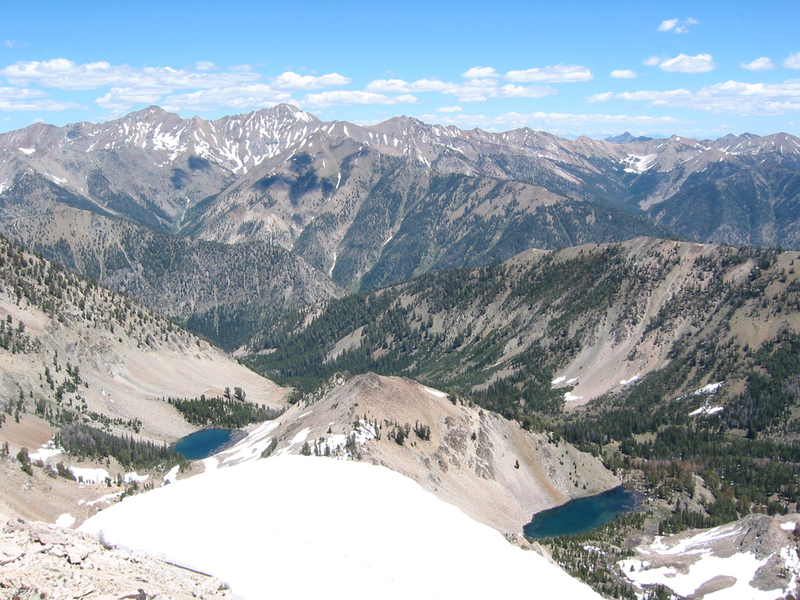 You also get an up-close view into Boulder Basin and the surrounding peaks. This shot is more or less north, showing Kent, Ryan, and the Amber Lakes. We still had a long way to go, and Laurie was waiting below, so soon we were off again. 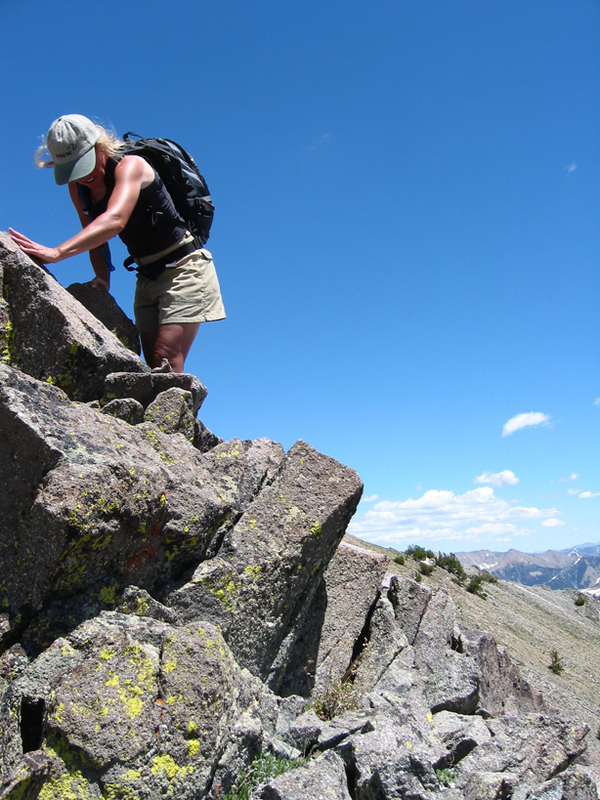 Here's Julie traversing the endless talus. She wasn't really very keen on the talus, but she liked the scrambling over the gendarmes. Once I figured that out, we started going up-and-over more than around. 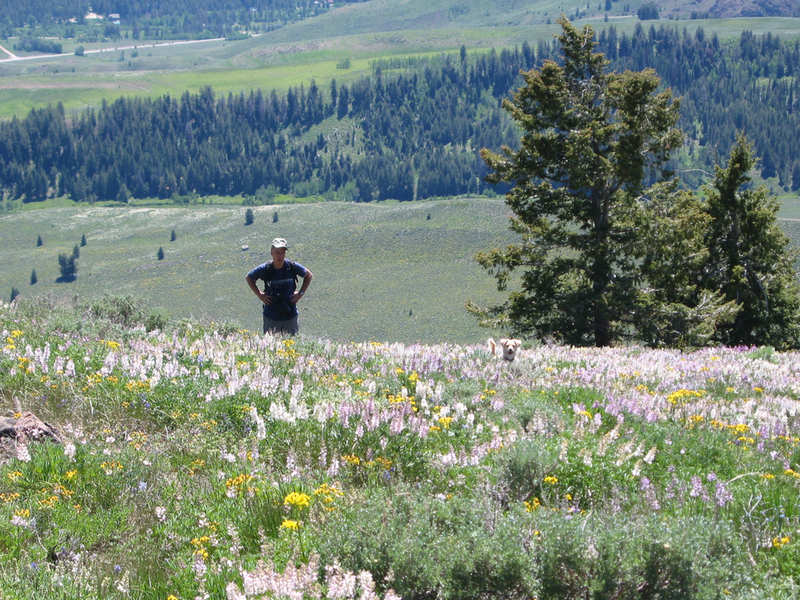 Once we got off the ridgetop and found Laurie, it was back to the wildflowers (and the heat). Sophie was a super little mountain dog, and the picture shows her head above the lupine- he had to stand up straight to be the taller. When we got down to the highway headed into Ketchum with Mexican food on our minds, there had been an accident so the highway was blocked. Estimate: 1 to 1.5 hours before we could get through. Desperate for cold beers, we took a chance and were rewarded at an open Galena Lodge with elk burgers washed down with our favorite frothy beverage.